There were the two linked promontories of Birgu and Senglea that made up the nucleus of Christian resistance, but these were interlinked with the fortress of Saint Elmo across the water on Mount Sciberras that provided the key to the best harbor. The main Ottoman camp at Marsa was six miles from the fleet anchored at Marsaxlokk, and the early skirmishes had revealed the need to guard the supply chain from ambush along its entire length. There were also the two forts in the hinterland to consider, that at Mdina and the other on Gozo, which provided potential centers of guerrilla warfare and rallying points if left unattended. One of these targets had to be chosen first; the others had to be managed. It would be necessary to split the army into sections. Perhaps twenty-two thousand fighting men was not so large a force after all. Other things were concerning the commanders too. Piyale was edgy about the winds, less predictable in summer than those in the eastern half of the White Sea. The imperative to keep the fleet safe was his absolute priority. Shipwreck or a daring raid by enemy fire ships would commit the expedition to lingering but certain collective death at the hands of an enemy with reinforcements uncomfortably close at hand. Malta, lying under the eagle wing of Christian Sicily, was the king of Spain’s domain; sooner or later a counterattack was certain. The long lines of communication, the finite time frame, the inability to remain on Malta over the winter—all these things were weighed in the balance. Relations between Mustapha and Piyale were tense as the options were discussed on May 22. The admiral and the general had issues about priorities and seniority; both were aware of Suleiman looking over their shoulders; he was there by proxy in his banners and flagship, more directly in the presence of his personal heralds—the chaushes—who reported back to him directly. Both Piyale and Mustapha were well-connected within the Ottoman court; both were eager for glory and to avoid disgrace. The two were united only in their jealousy of Turgut, the third player in the sultan’s triangle of command, expected any day from Tripoli. Christian accounts provide vivid and probably highly imaginative accounts of the wrangles, the choices, the votes cast on the day—it is highly unlikely that any Christian slave was present in the pasha’s ornate tent—as they lobbied for their tactics. 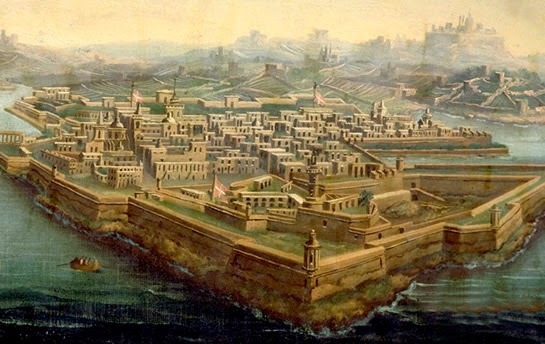 In the end they chose the objective that Don Garcia had predicted they would: the little fort of Saint Elmo, “the key to all the other fortresses of Malta.” This decision had probably been taken months ago in Istanbul, well before departure, at a divan meeting on December 5, 1564, when engineers laid plans and models of Saint Elmo before the sultan, explaining that they had found it to be “on a very narrow site and easy to attack.” At the time Spanish spies in the city had filed a report back to Madrid that was eerily prophetic in all but one respect: “Their plan is to take the castle of St Elmo first so that they can get control of the harbour and put most of their ships there to overwinter and then capture the castle of St Angelo by siege.” Now Mustapha’s engineers studied the site again and were confident it would be an easy task, “four of five days” was the estimate; “losing St Elmo, the enemy would lose all hope of rescue.” But if they were confident of taking the fort quickly, there was also a note of defensiveness, even fear, in this decision. Saint Elmo would “secure the fleet, in which lay their safety, by drawing it inside the harbor of Marsamxett, out of all danger from prevailing winds and maritime disasters and all possibility of enemy attack…[and]…of all dying on the island without being able to escape.” Even at the outset they were pondering the implications of operating so far from home. For Piyale particularly, preserving the fleet was the key to everything. The commanders decided not to wait for Turgut to confirm this decision; time was pressing. They set to work straightaway. Time was critical for La Valette too. When he learned of the Ottoman plan from escaped renegades, he was said to have given thanks to God; the attempt on Saint Elmo would buy a breathing space to repair the defenses of Senglea and Birgu and time to dispatch pleas to Don Garcia, Philip, and the pope for a rescue fleet. Work continued on the fortifications day and night; obstacles outside the walls that could provide sheltering positions for the enemy—trees, houses, and stables—were demolished; the whole population was engaged in hauling vast quantities of earth inside the settlements for running repairs to walls damaged by gunfire. All that the grand master had to do was persuade the garrison over on Saint Elmo to sell their lives as dearly as possible. The defenders made their own preparations. As the Turks established their positions on the peninsula, the only safe way out of Saint Elmo was by boat from the rocky foreshore across the harbor to Birgu, a distance of five hundred yards. La Valette ordered the evacuation of some women and children who had taken refuge there, and he sent back supplies and a hundred fighting men under Colonel Mas, sixty released galley slaves, food, and ammunition. In all there were about seven hundred fifty men in Saint Elmo, the majority of whom were Spanish troops under their commander, Juan de la Cerda. From the landward side, where the Turks were establishing their gun platforms, Saint Elmo presented a long low raked profile, like a stone submarine floating on the end of the rocky ridge. Two of the four points of its star faced the hill on which the Turks were establishing their position. The fort was protected at the front by a stone-cut ditch, and at the back on the seaward side by a detached keep, a cavalier, which reared up above the whole fort like the submarine’s conning tower. Hidden in the heart of the fort were a central parade ground—protected in front by a blockhouse—a cistern for water, and a small chapel to provide for the men’s spiritual needs. The hastily constructed triangular ravelin was outside the fort and linked to it by a bridge; it provided some protection from a flank attack, but to an experienced siege engineer looking down from the heights of Mount Sciberras, Saint Elmo looked small and vulnerable. There were numerous shortcomings; the fort’s design was poorly thought out and badly executed. It had low parapets and no embrasures to protect the men, so that no defender could shoot without making himself a clear target; its small size precluded the siting of many guns on the ramparts; it lacked sally ports from which troops could safely exit to clear the ditch of enemy infill or launch counterattacks. Worst of all, the angles of the stars were so sharp that there were large areas of dead ground beneath the ramparts upon which defenders were unable to fire. The Ottoman engineers’ assessment of the task ahead seemed reasonable. To all intents and purposes, Saint Elmo was a stone death trap.